How much of California’s $9-billion budget surplus should go to fight homelessness? 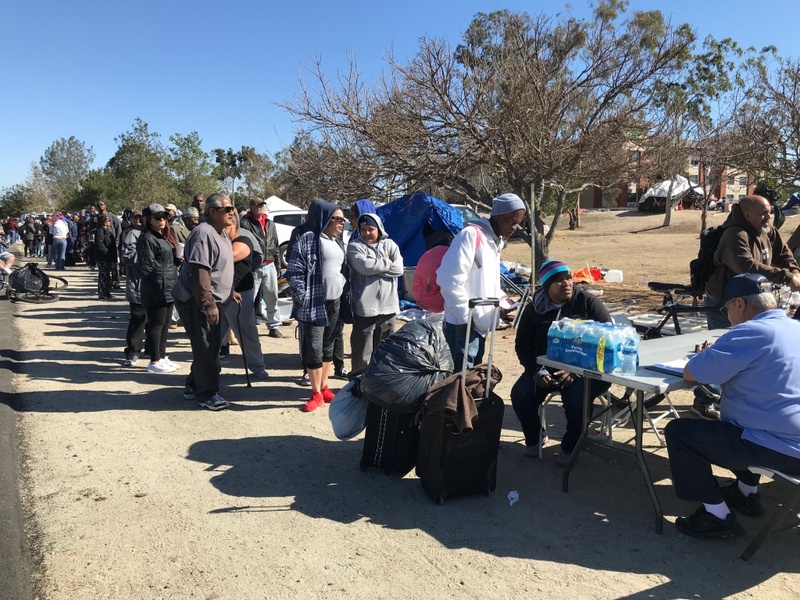 A line of homeless people at the Santa Ana riverbed wait to get connected with a motel room or shelter on Tuesday, Feb. 20, 2018. The homeless problem has reached crisis level in the state. Mayors across the state are banding together to ask the Brown administration for $1.5 billion to tackle homelessness in their cities. The coalition is made up of mayors from 11 of the biggest cities in the state, including Long Beach, Los Angeles, Santa Ana, and Anaheim. Governor Brown has said that he wants to devote about $350 million to help fight homelessness. The governor has also called for a $2-billion bond for homeless housing on the November ballot. San Francisco is feeling the impact of homelessness on tourism; should LA worry? Is it time for LA to restart arresting people living on the street? With Social Security costs exceeding its revenue, is the program in trouble? Some residents say this Koreatown spot isn’t right for a homeless shelter, but is there a good place in Los Angeles? Is the city creating a monopoly with its proposed scooter and bike-sharing regulations?